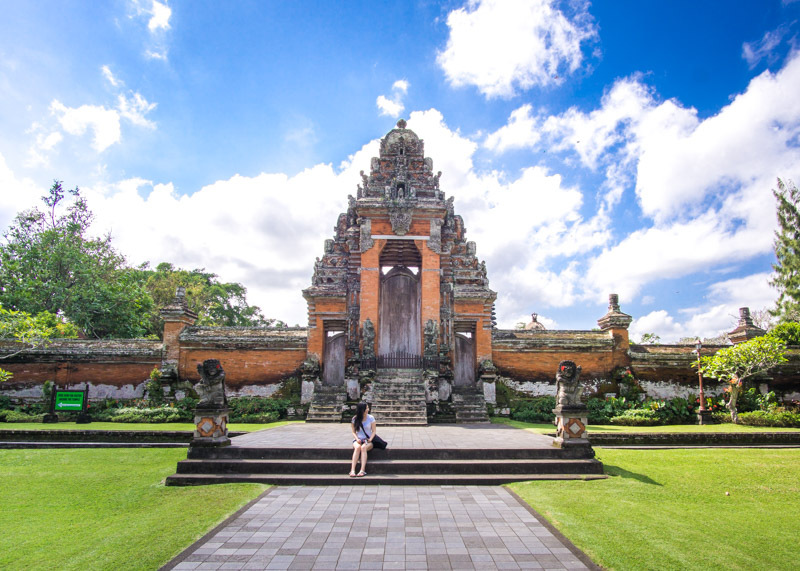 We had an inkling that we would feel exhausted after travelling around Bali for almost a month. And we were right. After spending three weeks in Kuta, Seminyak, and Sukawati, we needed a few days of tranquility. 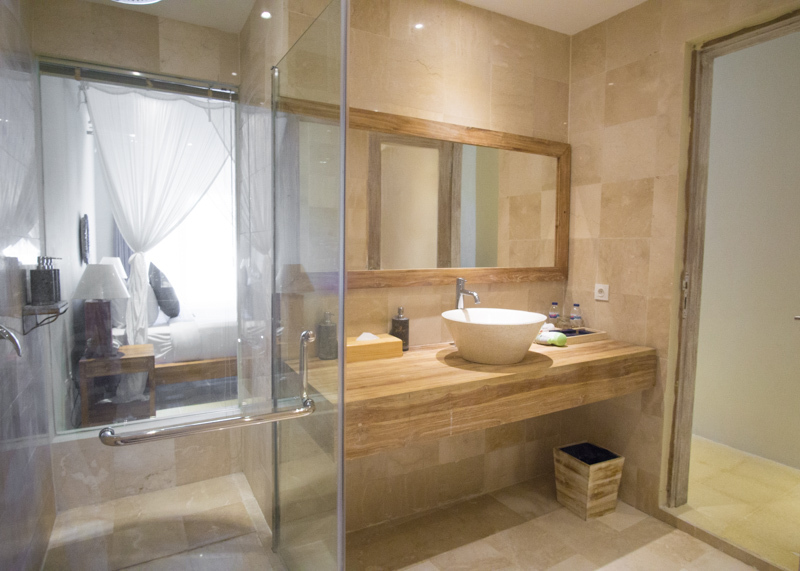 And this is exactly what we got at La Berceuse Resort and Villa. 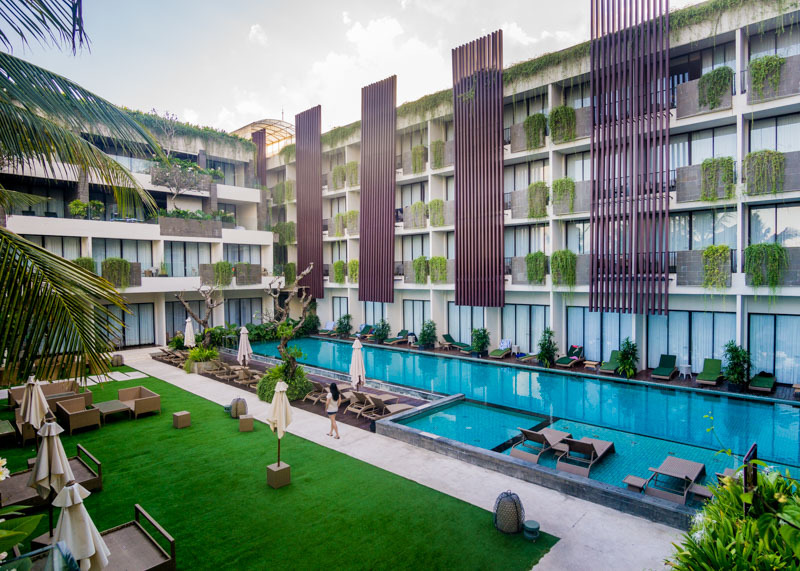 While this Nusa Dua resort recently opened their doors in 2017, they know a thing or two about making guests feel serene. With only 30 units in total, this Nusa Dua resort allows for personalized service to all guests. By our second day, we recognized most of the staff, and they remembered our quirky preferences as well. If you’re wondering if there is any relation to the name of this resort and Van Gogh’s famous painting, then yes, you are correct! La Berceuse is a favourite picture of the resort owner, and La Berceuse Resort & Villa is aptly named to reflect his admiration of this artist. 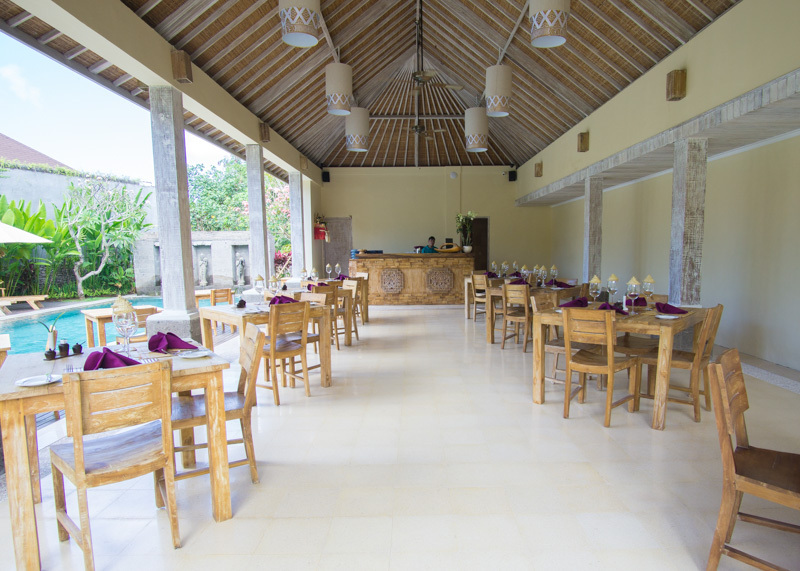 The resort itself is managed by the Satyam Hospitality group, a prominent company in Bali. 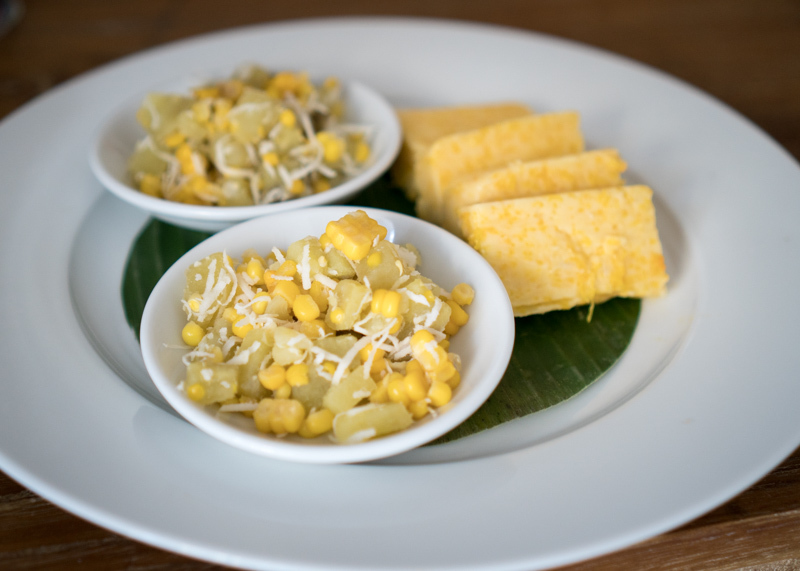 This hospitality group named their business Satyam to reflect the Balinese Hindu lifestyle in their business. 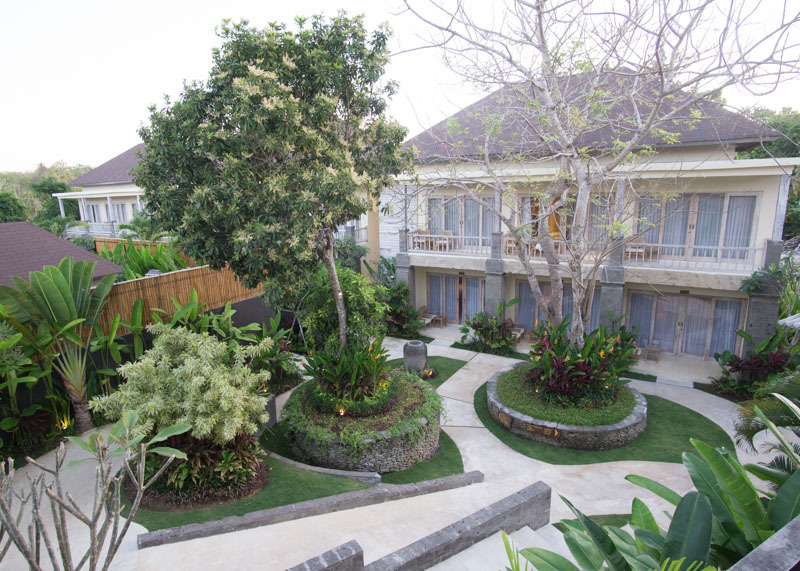 Every aspect of their business embodies tri hita karana, which stands for the three causes of well-being and encourages harmony amongst the people, nature, and God. Gary and I were very fortunate to chat with Gde Budiada, the marketing director of Satyam Hospitality. It was evident to us that management applies forward-thinking philosophies to their business practices. Gde also made it clear that management values the one resource that all companies should place as a priority; their staff. While some staff members have little experience in the hotel industry, Gde’s bases his hiring principals on a person’s attitude, aptitude, and self-awareness. Everyone has to start from somewhere, and it’s impressive how Gde is willing to give these people a chance. This practice reminds me of Simon Sinek’s famous words: “If you hire people just because they can do a job, they’ll work for your money. But if you hire individuals who believe what you believe, they’ll work for you with blood and sweat and tears.” And this is what we observed at La Berceuse Resort and Villa. The staff members work hard because they believe in what they are doing, and they love their job. We stayed at a time when the resort was almost at full capacity. In the mornings and dinner time, the staff was frantically on their feet, tending to clients. But there were those brief moments when I saw the strong sense of camaraderie amongst the team. After all the hustle and bustle, I saw one staff member pat the other on the back as the two walked side-by-side. It was also so great to see how much Gde cares about the career development of his people. He takes the time to mentor his staff, and he fights for their well-being. Sometimes, he even sacrifices benefits that can go directly to him so that his team can reap the rewards. When the people experience financial gains, they can give something of value to their family; education. We spoke at great lengths about education, and we both agree that education has a huge impact on life. Gde is about changing the lives of other people by giving them the financial resources through employment. That way, the Balinese people can fund their families’ education so that they can have a better life. This thought really resonated with me because it was my parents’ dream for me to get a good education too. They also had a tough life and did not want me to experience their sufferings. It was their belief that education opens opportunities and shields me from what they went through. I think they were right. Gde’s story is a fascinating one that reflects how you can change your life through persistence. 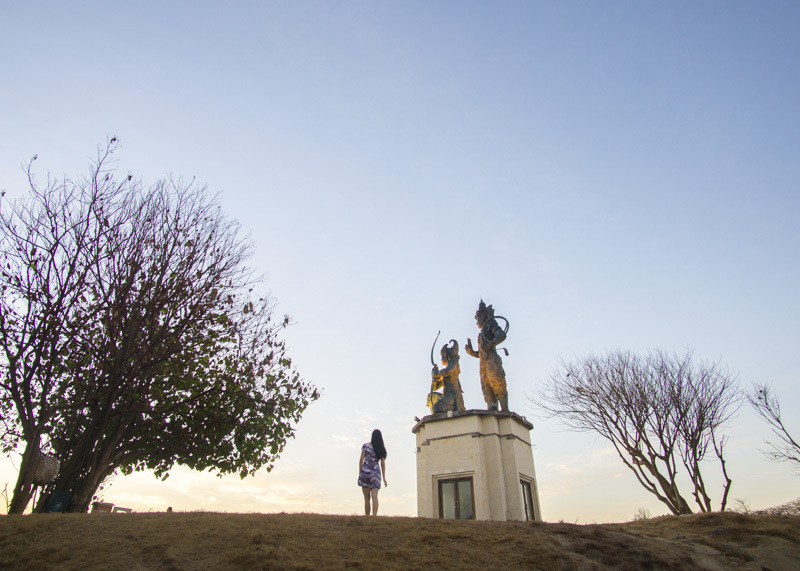 Gde came from a modest village and could not afford to study past high school. While many universities accepted him, he could not attend post-secondary school due to financial constraints. Instead, he started his career as a gardener before working his way up to where he is today. 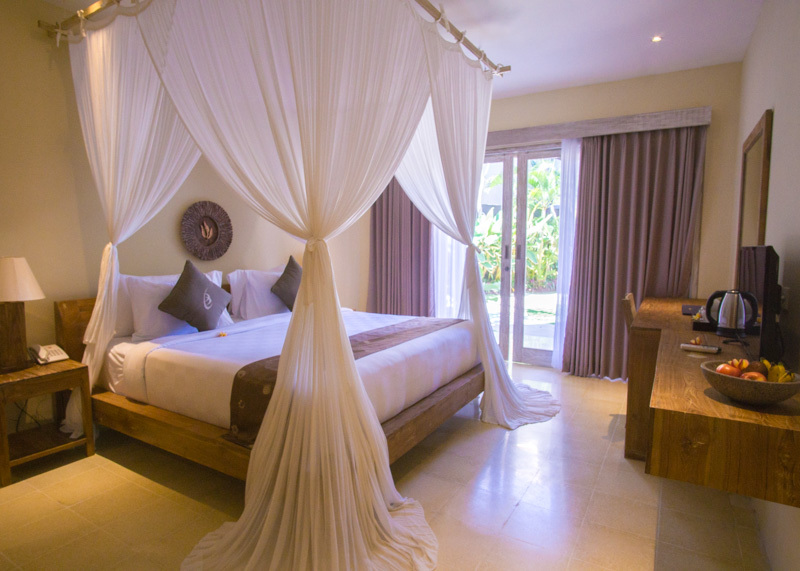 Are you ready for the tour of the deluxe room at this Nusa Dua resort and villa? 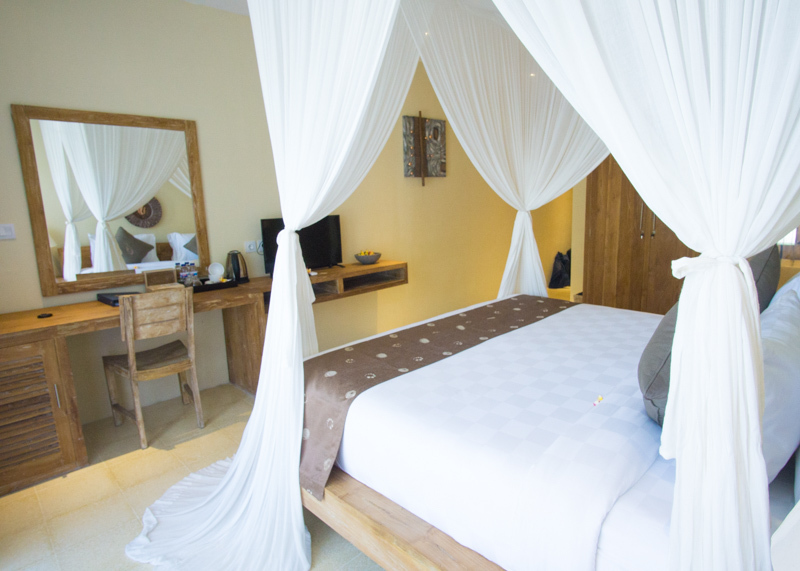 We stayed in the deluxe room at this Nusa Dua resort. The room is modern, peaceful, and created the perfect ambiance for us to both relax and reflect on our journey of One Life Changing Year. I’ve always wanted to sleep in a canopy bed. Ok, I’ve slept under mosquito nets in Vietnam and Cambodia, but it’s not quite the same. In those two circumstances, I was sleeping on the ground with rats watching me while I heard strange animals howl into the night. Hence, it felt very different sleeping in this canopy bed versus my prior experiences. 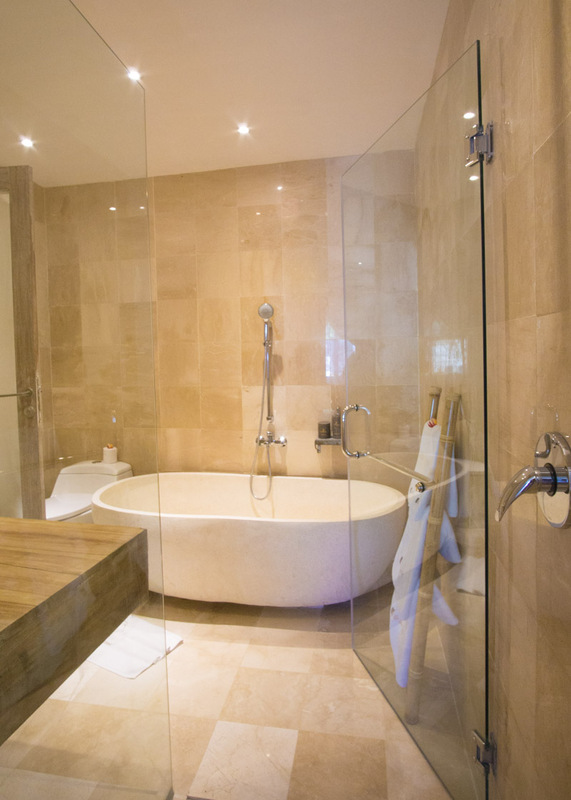 The tub was HUGE, and it was so great to soak and unwind after a long day. 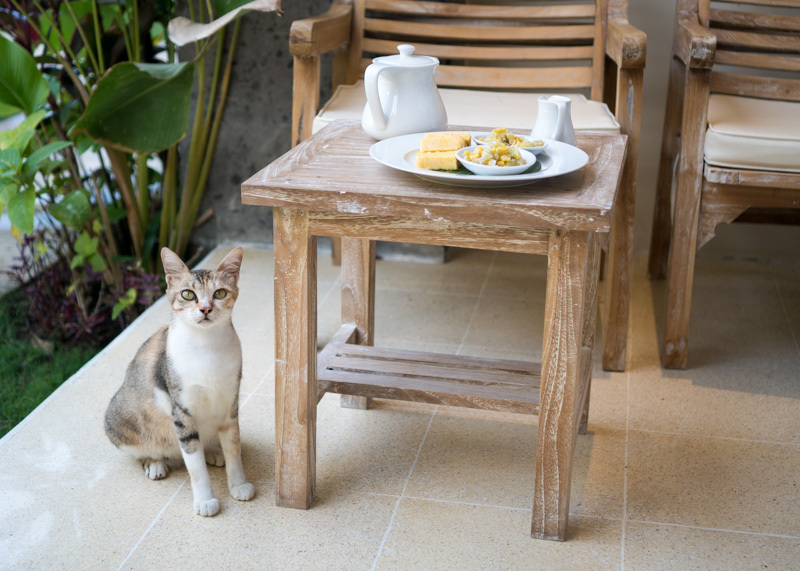 What I also loved about this Nusa Dua resort is how the staff members respected animals that ventured onto their property. I am a bit scared of cats (I don’t know how to interact with them! ), and this cat kept following me during our stay at La Berceuse. At one point, the staff ushered the cat away so we could leave our room (she barricaded me!). I was worried that I got the cat in trouble, so I told Mardiana and Adi about the cat. Immediately, they knew which cat I was talking about and told us that she is pregnant and probably very hungry. I was very relieved to hear that I didn’t get the cat in trouble… and of course, she showed up at my doorstep again the very next day. This time, I wasn’t as scared of her, although she kept meowing and looking at me. 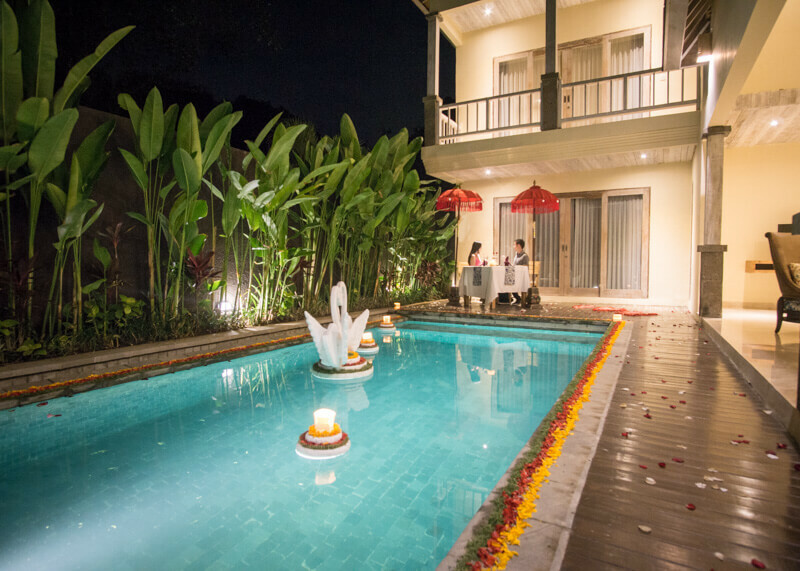 We also had the opportunity to stay in their one-bedroom villa and experience a romantic dinner during a portion of our stay. 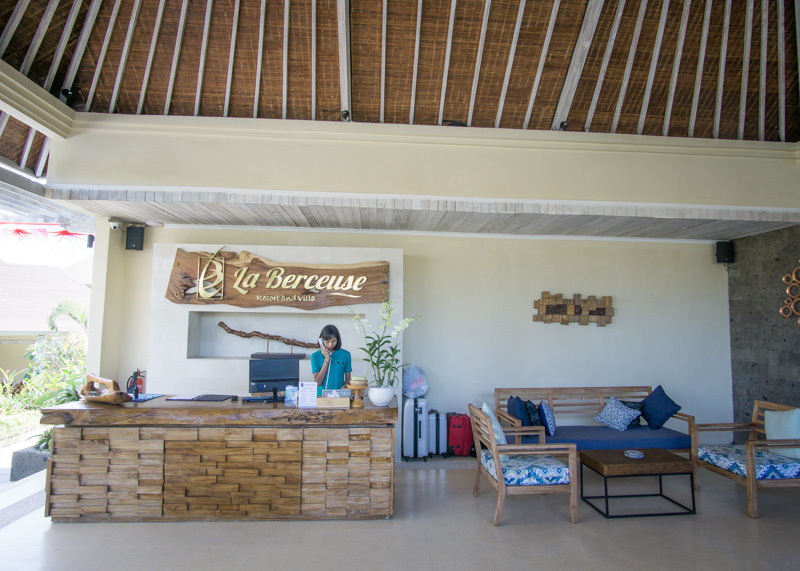 What makes La Berceuse stand out is the exceptional service from the staff. 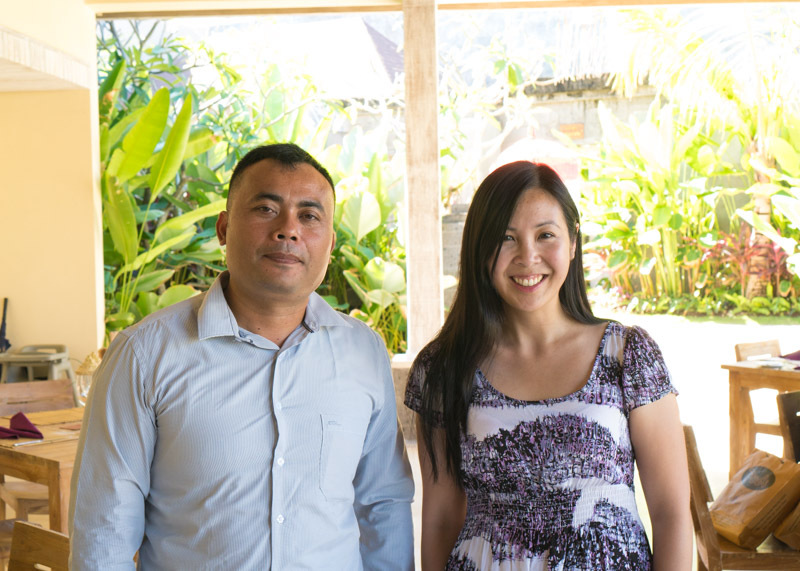 Given that it is a smaller boutique resort, we had the chance to get to know many of the staff members during our stay. All the employees are very warm, and they made us feel as if they genuinely cared about us. Everyone was polite, kind and it was great to talk to each of them. Through our conversations, I learned a bit about the Balinese culture and their lives. If you stay at this resort, Indah, Cynthia, Mardiana, Adi, Eka and Sedana (Hi guys! We miss you!) will surely go out of their way to make your stay much more pleasant. La Berceuse also has a free daily shuttle service that was quite easy to arrange. While most accommodations offer only drop off shuttle services, this resort offered pick up service as well. The transportation was well organized and convenient for when we ventured outside the resort. La Berceuse is tucked away in a remote area and is extremely quiet and peaceful. No hectic cars or motorbikes streaming by, just utter serenity. 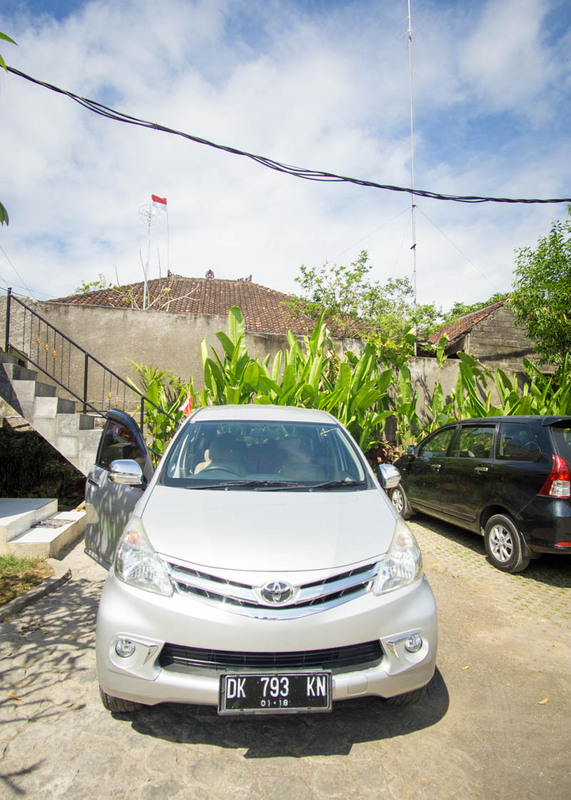 The area is also very safe and clean, with lots of security all around Nusa Dua. 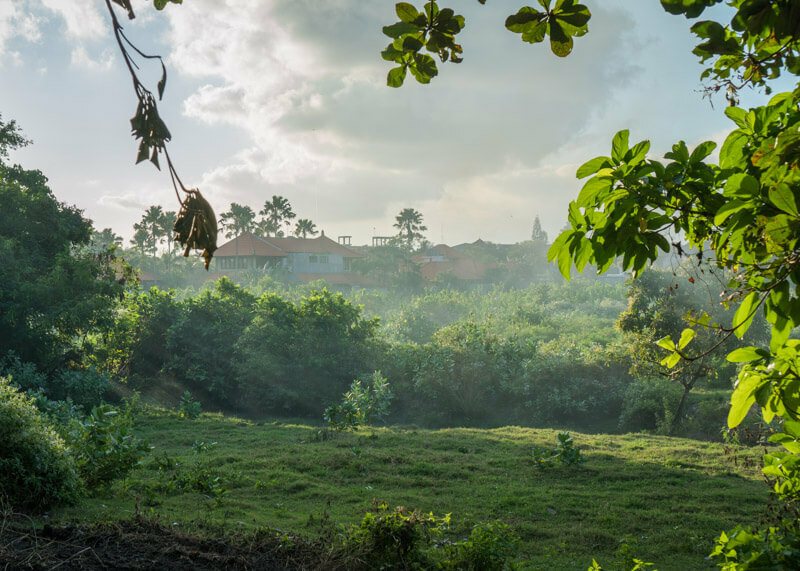 Most of Nusa Dua is a conglomerate of resorts and is not suited for people to explore the area on foot. We used the shuttle service to drop us off at the Bali Collection and have us picked up at the Bali Beach Club. Both locations are about a ten-minute drive from the resort. 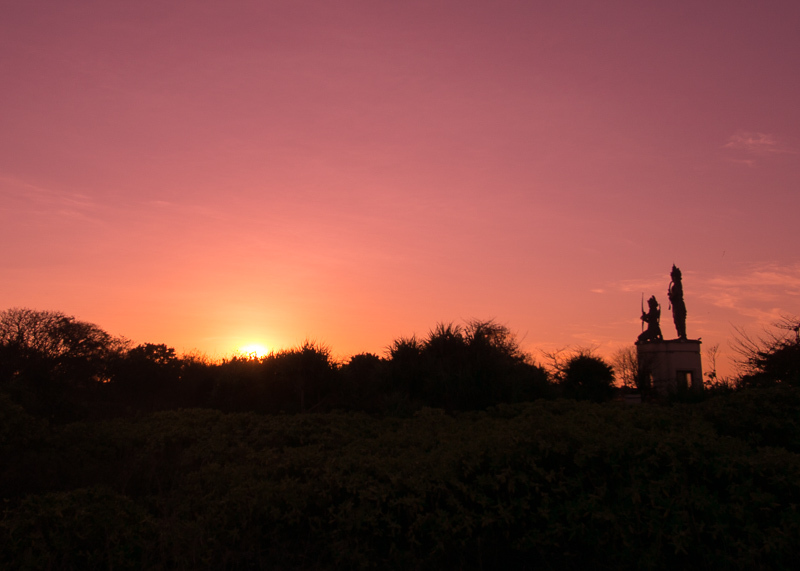 We visited the Nusa Dua Peninsula and Mengiat Beach one evening where we caught a beautiful sunset. 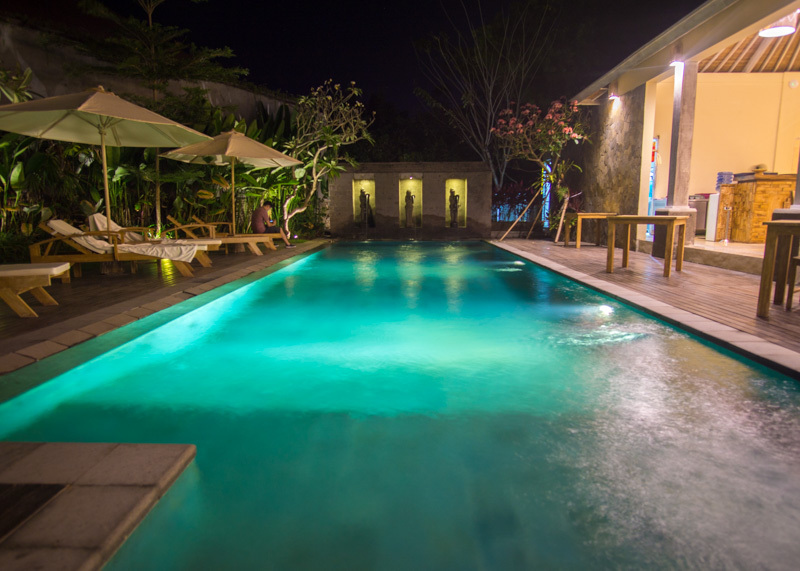 The resort had a lovely swimming pool next to the Sawangan restaurant, as well as a spa service for those who want some extra pampering. Gary and I usually stay away from hotel restaurants and venture out on our own for meals. In this case, because our goal was to relax and rejuvenate, it was too much effort to go out and find food. 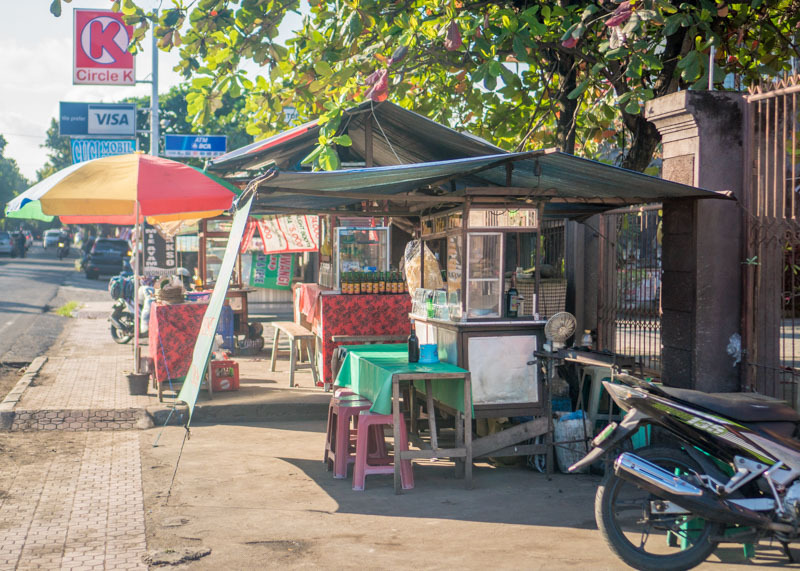 Plus, Nusa Dua is not suitable for walking – the streets are barren, and the roads are between the walls of resorts. This is where it’s important for resorts to have delicious food for the guests. Fortunately, all the meals at La Berceuse are super yummy. 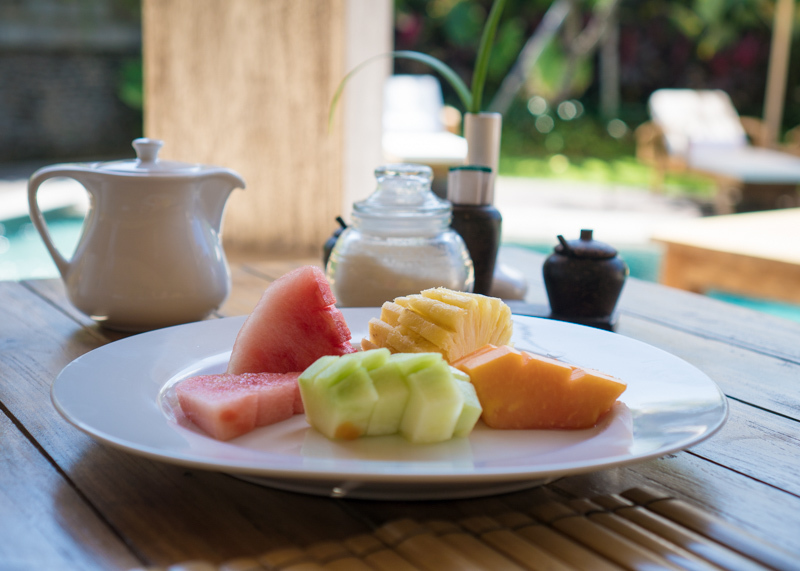 Good food at a resort is important when it comes to staying in Nusa Dua, especially at a remote resort. 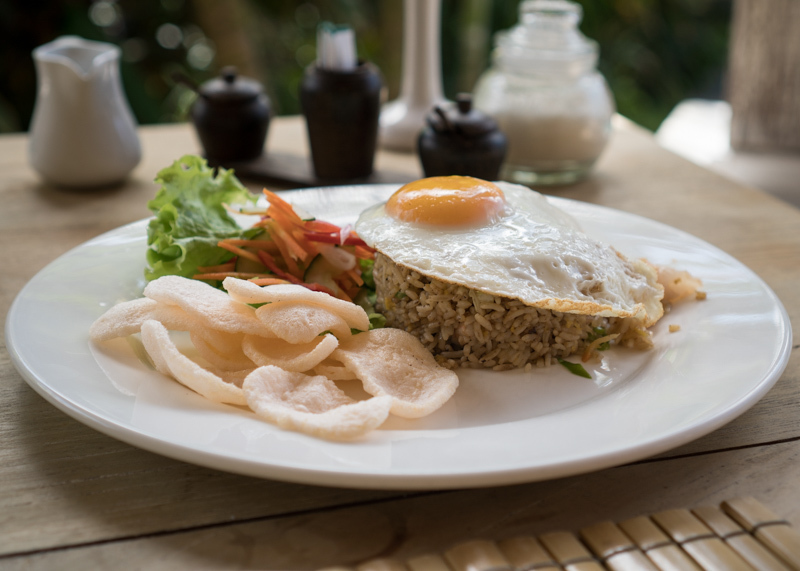 And boy, the food did not disappoint at this Nusa Dua resort. La Berceuse did well when it comes to food, and that’s because of the head chef. Mardiana has over 15 years of experience and started his career working on cruise ships in the kitchen. He also trained with chefs from Hong Kong at Le Meridien, further diversifying his experience. 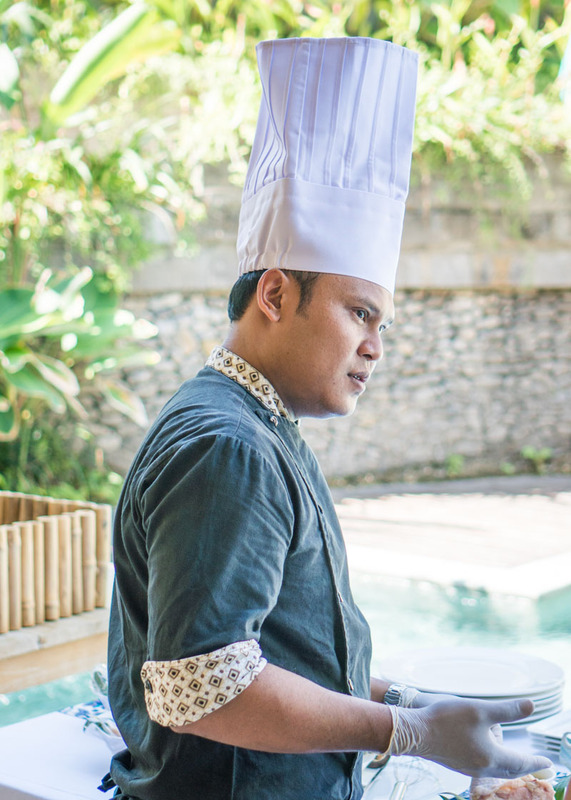 We loved every single one of his dishes, and in my opinion, he cooks THE BEST bubur ayam (aka congee) in the world! No joke, that dish had healing powers and healed me (I was a bit sick before staying at this resort). 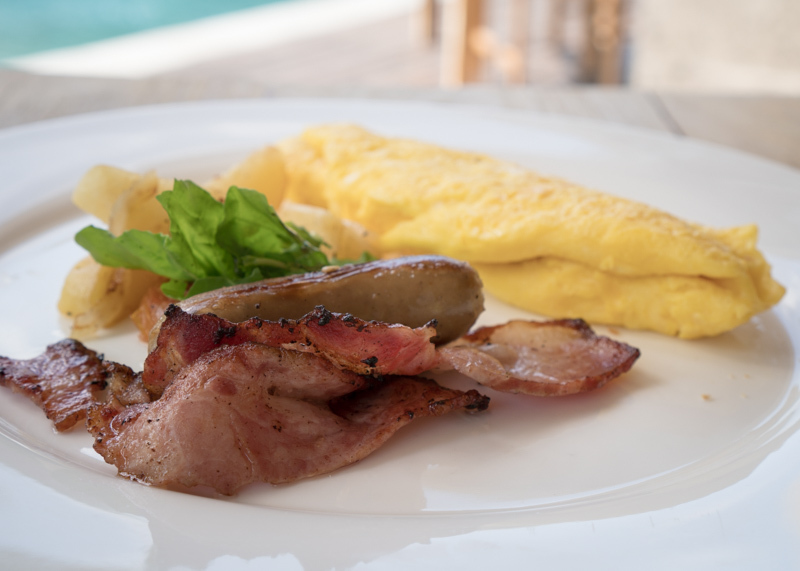 We were very impressed with the breakfast at this Nusa Dua resort. 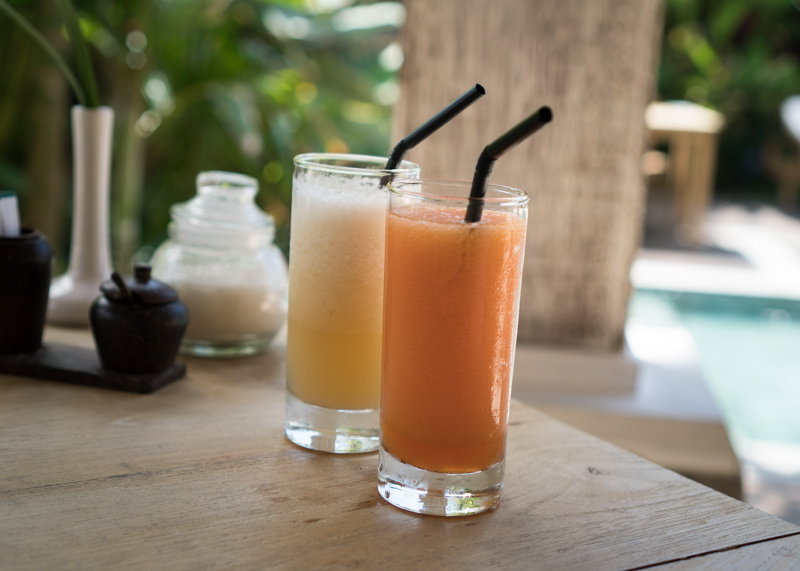 All the drinks were from fresh fruit and came in delicious flavours such as papaya juice and watermelon juice. Most Asian people know this porridge as congee, which is the main dish that we Asians eat when we feel sick. This meal is akin to the Asian version of chicken noodle soup, but with mushy rice. Because I was recovering from Bali belly, I wanted something mild and easy on the stomach. When I ordered this babur ayam, I was expecting plain white congee with egg. 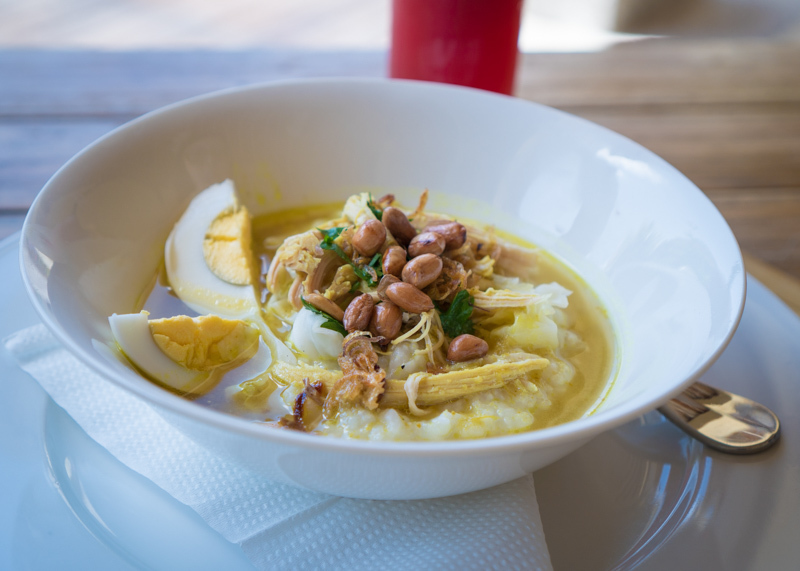 But nooo… I was in for quite a pleasant surprise when I had my first taste of bubur ayam. Not only is this dish beautifully plated, but the soup base is flavourful! Mardiana mixed in turmeric, ginger, garlic, kefir leaves and lemongrass in the soup base. All these ingredients are imperative for good health, and I’m willing to bet that I made a full recovery thanks to this dish. Honestly, hands down the best congee I’ve ever had in my life (sorry mom). Those side pickled vegetables may not look like much, but they were often my favourite part of the dish. The pickled vegetables had a sweet and mildly tangy flavour. 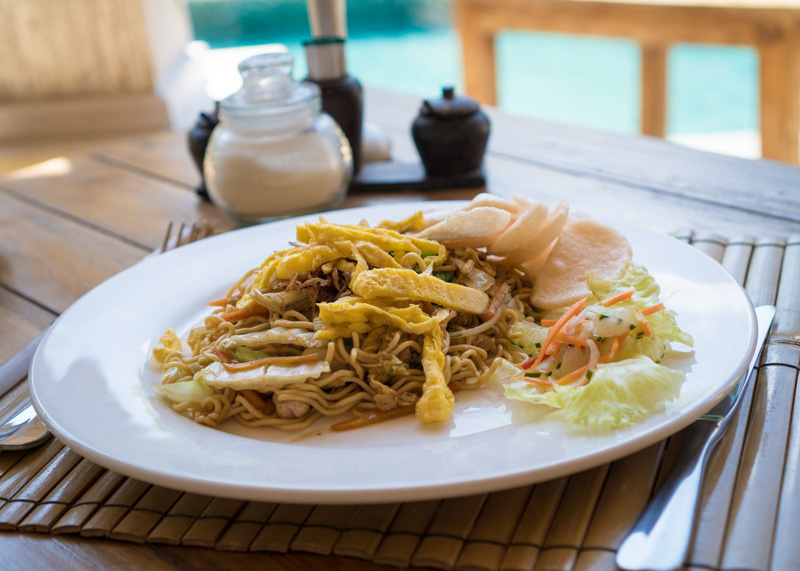 Gary has had mie goreng at over ten different places during this trip but felt that this dish was his absolute favourite. 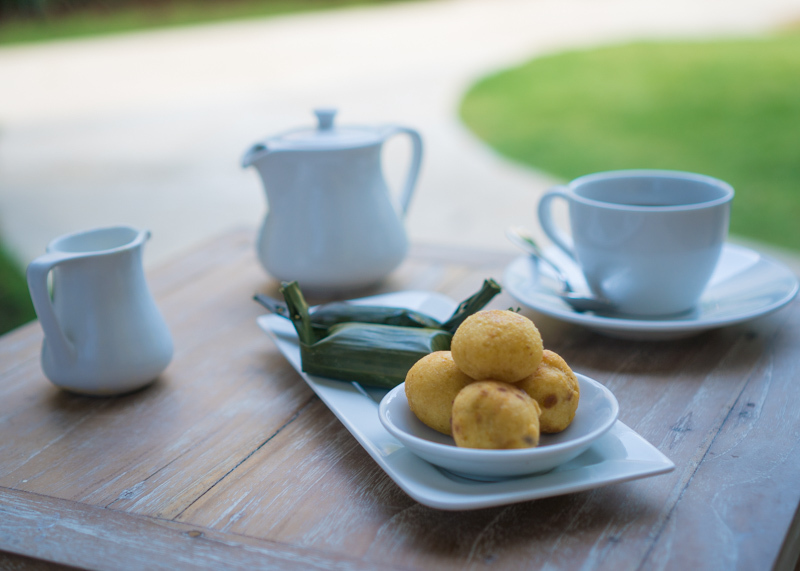 La Berceuse Resort and Villa also offers complimentary afternoon tea, which you can enjoy in the restaurant or your room. We loved that there was something different to try each day. While some might say that afternoon tea is just afternoon tea, every dessert brought back so many memories for me. I grew up eating similar desserts that my mom used to make when I was a child, but it’s been so long since I left home that I’ve forgotten how much I enjoyed them. 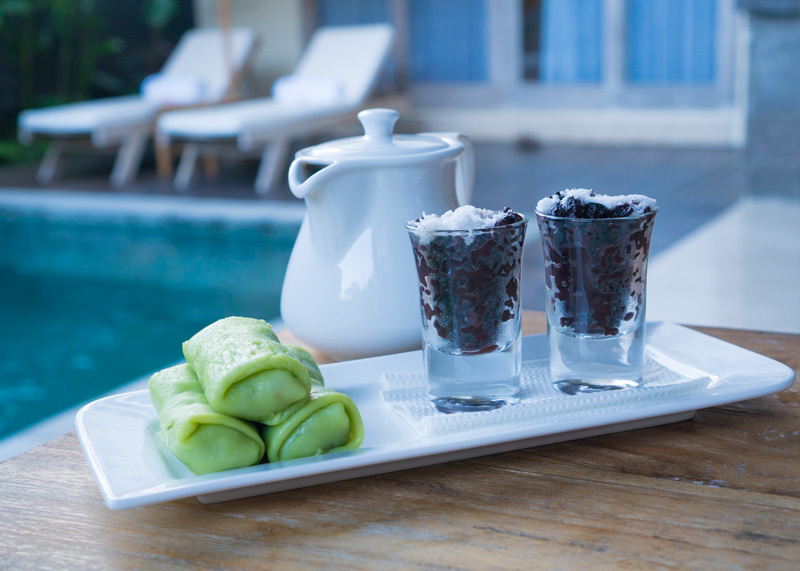 Pandan dadar gulung (pandan crepe with palm sugar) and bubuh injin (black rice pudding with grated coconuts). We had this dessert right next to our private swimming pool! 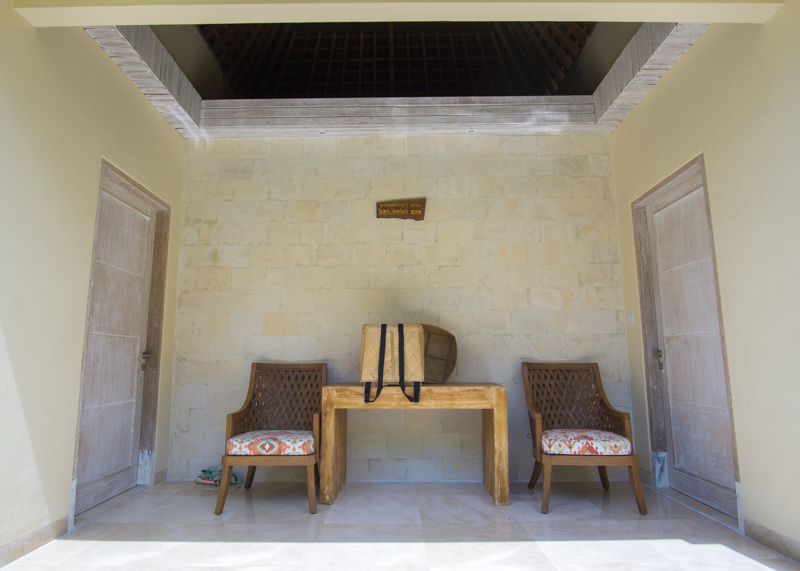 What I loved most about La Berceuse are the quiet moments at this resort. There were many times where we felt as if we had the resort to ourselves, especially at night. It gets so quiet that we feel like we need to whisper to avoid disturbing the other guests, even when it’s only around 8 pm. 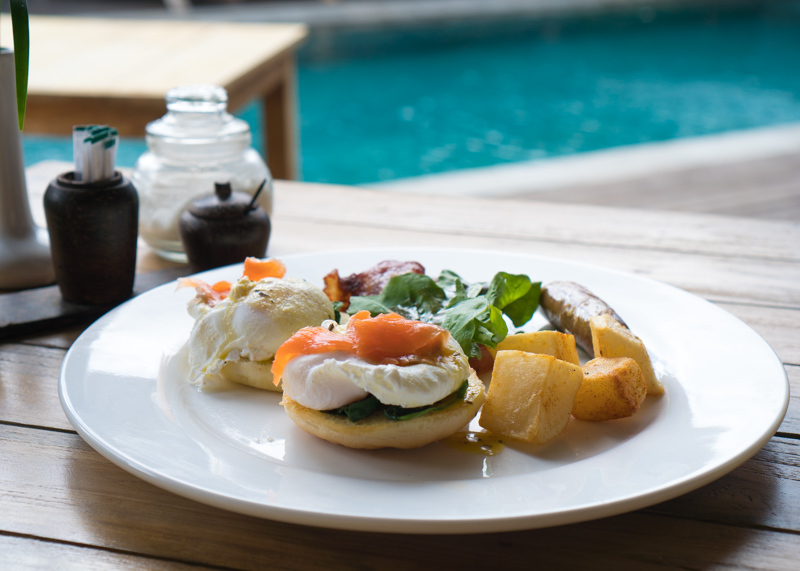 It’s only during breakfast do we realize that this Nusa Dua resort is close to full occupancy. 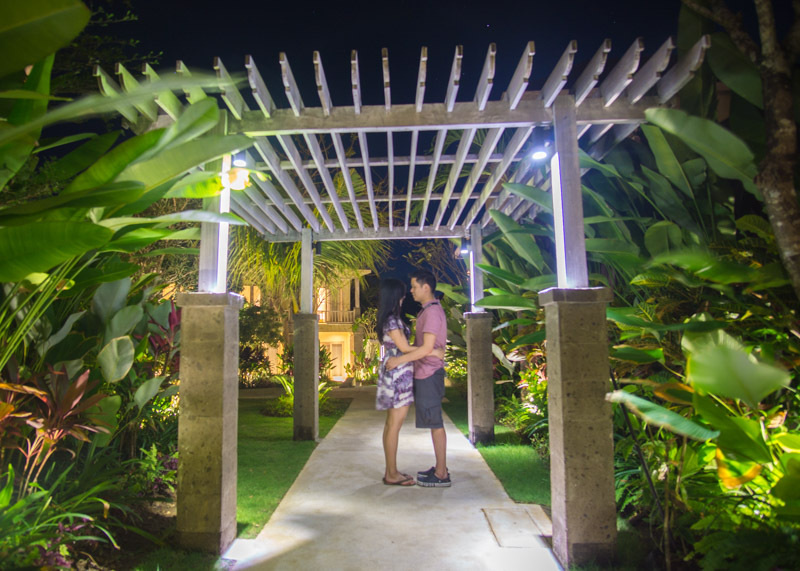 After exploring Nusa Dua one evening, Gary and I came back to take some photos of the resort. As we walked through the resort, songs from the 90s came on the radio, bringing back nostalgic memories. I sang along to Backstreet Boys and Westlife and some other 90s music that I loved in my childhood years. But it wasn’t until the song Take Me To Your Heart by Michael Learns To Rock brought back memories I had abandoned. You see, music has a powerful effect on me, as I’m sure others can relate as well. Music triggers neglected memories. Years may have passed, and life has a way of building moments upon moments, but a song will provoke emotions that I thought were long forgotten. Like this song by Michael Learns To Rock. The funny thing is that I didn’t even know there was an English version of this song. I grew up hearing the Chinese and Vietnamese version of this melody! Seriously! This whole time, I thought the Vietnamese made a knock-off version of an original Chinese song… not realizing that the Chinese version is a copy of the English version! 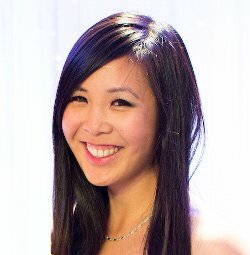 Can any of my Asian readers relate? And for the rest of you… guys, listen to all three versions and tell me what you think! As a child, I would only fall asleep to the Vietnamese or Chinese version of this melody on my cassette tape. This song may have even been a theme song for one of those Chinese drama series that I grew up watching with my mom. So many memories, so many thoughts. The only word that comes to mind is that I felt very deeply when these memories came flooding back to my heart. And this Nusa Dua resort created the perfect ambiance for me to reflect on long-forgotten moments. Flashbacks of my childhood. A reminder of how I’ve always bounced in three different cultures. Moments that created the person I am today. Thank you, La Berceuse for creating these special little moments. And for triggering forsaken memories. Most importantly, thank you for creating a tranquil space for me to reflect and reminisce about life’s precious moments. 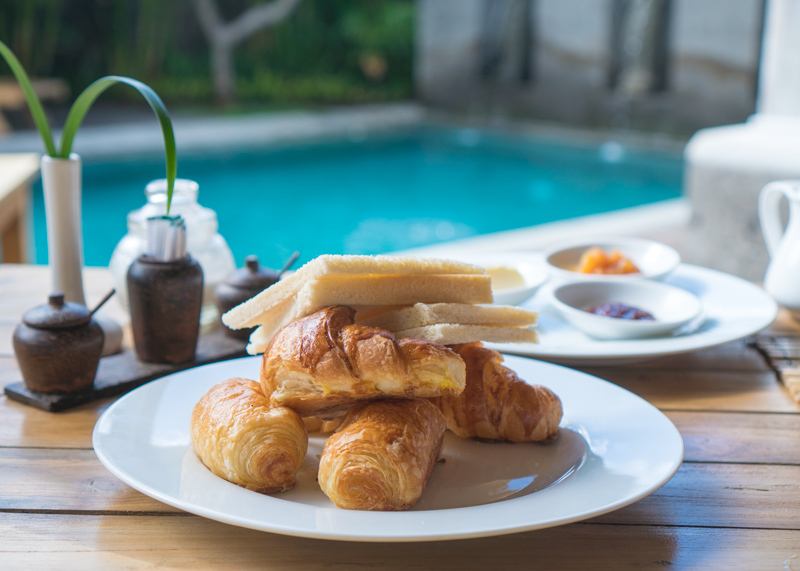 Our stay at La Berceuse Resort And Villa was the perfect way to end our month-long trip in Bali. This Nusa Dua resort delivered our wish for a quiet and peaceful place to relax, and I’m sure you will feel the same too. 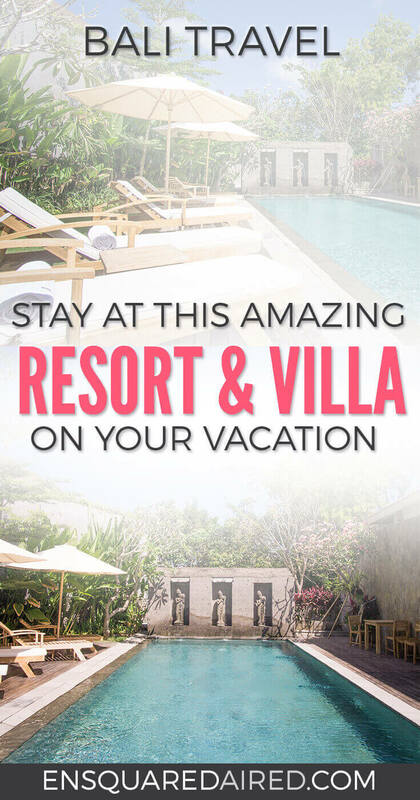 Check them out on their website for more information about this resort or contact them at gsa@laberceusebali.com. Thanks, friendship! Just wait until you see my post about their villa 😉 I couldn’t help but think about how awesome it would be to round up some of our friends and dance the night away to EDM while I was there haha! Ah, that’s so interesting, I never thought of the connection between the two! I’m sure you will find your way back to Bali again someday 🙂 We still feel like there’s a lot that we missed even after a month of staying in Bali! You really know how to pamper yourself 🙂 A wonderfully detailed account of your stay. Informative. The marking director sounds like a great leader as well. He’s right: there’s a distinct difference between a boss and a leader. Looking forward to your next post, little sister. Thanks, Anh Hai 🙂 Indeed, he is a very innovative leader! I felt so much wiser after talking to him! Indeed it is very beautiful!